Last week, a reader noted some serious progress on the space and snapped some photos. You can see some photos from their menu here. 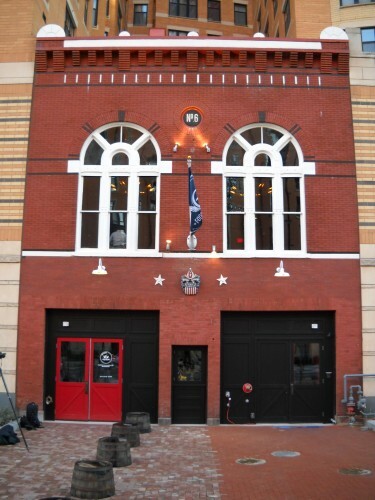 Douglas Development is pleased to welcome Sixth Engine, a firehouse inspired American bistro, as the newest addition to Washington, DC’s Mount Vernon Square neighborhood. The restaurant will open its doors Friday in the Douglas Development-owned historic Engine 6 firehouse at 438 Massachusetts Ave, NW. Sixth Engine leased the 3,600 square foot property from Douglas Development in March 2011. The restaurant is owned and operated by Gavin Coleman, Jeremy Carman, Paul Holder, Paul Madrid and Tim Walsh. These seasoned restaurateurs are also behind the Capitol Hill staple The Dubliner and the Glover Park restaurant and bar Town Hall. The team’s interest in finding a property in a vibrant neighborhood with outdoor seating led them to the old firehouse; once they realized the building’s unique history, they were sold. To reflect the restaurant’s commitment to preserving the historic building, elements from the original Engine 6 firehouse are integrated throughout the restaurant’s interior space. In addition to the firehouse’s original shield displayed outside the entrance of the restaurant, Sixth Engine features giant murals including depictions of a faded ladder company logo and a Norman Rockwell-inspired illustration of a fireman, boy and dog rushing off to a fire. Sixth Engine also boasts an authentic fire pole connecting the two-level restaurant. The Engine 6 firehouse is the oldest firehouse in Washington, DC. Built in 1855 for the Metropolitan Hook and Ladder Company (MHL), the firehouse still retains the original “MHL” insignia above the entrance. Douglas Jemal recognized Mount Vernon’s potential long before other developers and retailers, which is what led him to purchase the firehouse from the city in 2005. Today, the neighborhood is one of the most sought after addresses in the District and continues to attract top restaurants and retailers like Sixth Engine.